Now that Democrats have retaken the House, a debate that had previously been theoretical fodder for midterm campaigns has become very real: should Nancy Pelosi reclaim her position as speaker of the House? Nancy Pelosi says yes, obviously. 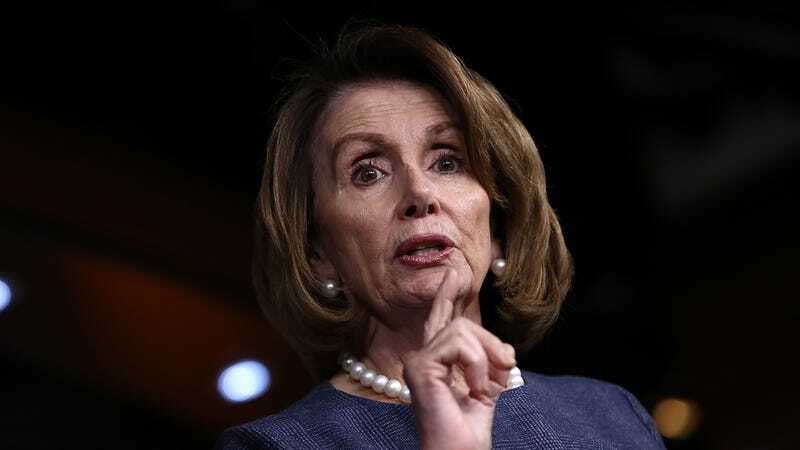 But for all the focus on Pelosi and the fretting over a lack of women in leadership positions, less is being said about the fact that the top three House Democrats—Pelosi, 78; Steny Hoyer, 79; and Jim Clyburn, 78—will, by most accounts, hold on to their power. This, in the wake of an election in which the message revolved around change and fresh leadership and at a time when the most galvanizing new members of the House are progressive women of color who campaigned hard on Medicare for All, radical action on climate change, and raising the minimum wage. Pelosi, meanwhile, in a speech on election day and the day after, called for bipartisanship, unity, and the need to “seek common ground,” a stark contrast to the wishes of much of the electorate that swept Democrats to victory and remains ready to fight. Case in point: On Tuesday morning, young climate activists, joined by Alexandria Ocasio-Cortez, held a sit-in at Pelosi’s office demanding a plan to combat climate change. “While the UN’s IPCC report says we only have 12 years left to get serious about getting off fossil fuels, Nancy Pelosi and the Democratic Party leadership are reviving stale, so-called ‘bipartisan’ ideas that get nowhere near the scale of the crisis,” Alexandra Rojas, the executive director of Justice Democrats, said in a statement to The Hill. Still, Pelosi’s likely victory to be the next Speaker continues to be framed as a victory for “women.” Which women is a question we never ask, and it’s a narrative trap that establishment candidates and the mainstream political press won’t let us out of. Like Hillary Clinton, Nancy Pelosi becomes an avatar for all women without questioning whether she is actually aligned with the parts of her base—young women, progressive women of color—that are currently demanding more accountable leadership. At a time when wages are stagnant, more immigrants are being detained than ever before, healthcare costs are continuing to drive people into poverty, and abortion rights are on the line, Pelosi’s (as well as the party’s leaders in the Senate—Chuck Schumer, I’m looking at you) embrace of a stale politics of civility and compromise is less relevant today than perhaps ever before. There are plenty of debates to be had about whether Pelosi should lead House Democrats into whatever comes next, but whether her loss would be a loss for women isn’t it.